Windows 8 and Office 2013! Windows and Office work together to turn your PC into a productivity tool. The unique Windows 8 interface combines with updates to Office 2013 to create a new computing experience. This book offers quick answers for when you get stuck. 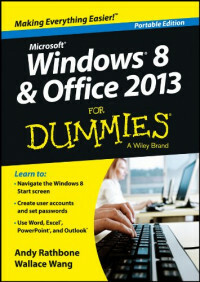 Learn your way around the Windows 8 Start screen and Charms bar as well as Office 2013 applications. Say goodbye to Windows(R) crashes, viruses, hassles, and cost!